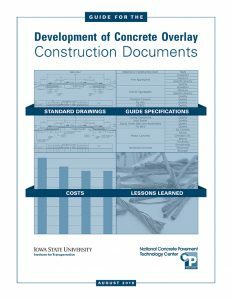 Three new manuals covering different aspects of concrete practices are now available from the National CP Tech Center. These publications are for use by industry professionals interested in the latest information on recycling of aggregates, geotextile use in pavements, and constructing concrete overlays. 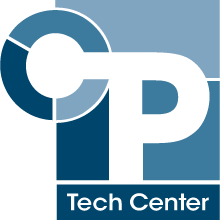 All three reference works can now be accessed from the CP Tech Center web pages. 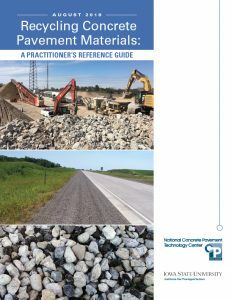 Recycling Concrete Pavement Materials: A Practitioner’s Reference Guide by Mark B. Snyder, Tara L. Cavalline, Gary Fick, Peter Taylor, Steve Klokke, and Jerod Gross, 88 pages. More practitioners want to employ recycled concrete aggregate (RCA) as a sustainable, economical construction option. This manual helps them determine: 1) if RCA is the right material fit for the project, 2) what applications are most efficient in their situation, and 3) how to manage specifications and field inspections. These and other design and construction considerations are covered in the new guide, seen by clicking here. Performance Assessment of Nonwoven Geotextile Materials Used as the Separation Layer for Unbonded Concrete Overlays of Existing Concrete Pavements in the US by Tom Cackler, Tom Burnham, and Dale Harrington, 45 pages. Geotextiles are being used more often in concrete workings and their effectiveness as interlayers has been further investigated and employed for pavement rehabilitation and construction efforts. This manual provides an in-depth summary of the performance, construction details, and ongoing optimization of nonwoven geotextile separation layers in paving projects. To see the new report, click here. Guide for the Development of Concrete Overlay Construction Documents by Jerod Gross and Dale Harrington, 45 pages. 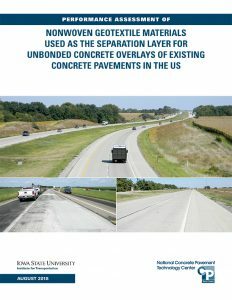 The authors have assembled a detailed professional set of directions to inform and enhance the successful use of concrete overlays in the field. The report includes examples of construction drawings and helpful information on specification, cost, and design of overlays. To see the new guide, click here.